Fabled as the birthplace of Aphrodite, goddess of beauty and love, Cyprus has holidaymakers smitten by its beaches, climate and scenery. Where better place to unwind in luxury than the island’s Hotel Almyra? As well as a wonderful range of children’s activities, it offers a good choice of family accommodation with bustling Paphos on your doorstep. We have over 40 years’ experience offering luxurious family holidays to the Mediterranean and beyond. 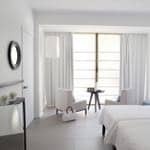 We highly recommend the Hotel Almyra in Cyprus – with a vast array of first-class facilities for adults and children alike, this luxury resort in Paphos has something for everyone. High on any family’s list of considerations, it’s also only 15 minutes by private transfer from Paphos airport. The Almyra’s sleek contemporary design is matched by its family-friendly warmth – from the outstanding Globetrotters and Baby-Go-Lightly services for babies and toddlers to the cool teen chill-out zone (in the summer holidays). For the in between ages, there is a superb age-banded Explorers’ Kids Club. There are no less than four outdoor and indoor swimming pools, one just for kids, and the hotel is located directly on a gorgeous, shelving beach. Add to that tennis courts and a nearby golf course and you’ll never be short of things to do. The oceanfront Almyra Spa is exceptional with pampering treatments and yoga classes. Choose from spacious garden and sea view rooms, junior suites and suites – some of which are interconnecting. The decor is modern, cool and airy, scoring high on comfort too. A choice of five superb restaurants offer varied dining options, from authentic Mediterranean dining in a casual beachfront taverna to sophisticated a la carte dishes. Opening in March 2018, the Parklane, A Luxury Collection Resort & Spa is another top notch option for families. Expect a floating restaurant, The Princess & The Pirate kids park with its own castle and water slides, a teen club, a 3,000 square metre spa and sleek, contemporary rooms and suites. Located close to Limassol, we’ve got some tempting opening offers too. Sovereign holidays include complimentary UK airport lounge passes and private transfers in resort. We work with the finest family friendly hotels to source the best offers, including free child places, complimentary nights, board and room upgrades to offer exceptional value luxury family holidays. Find out more about the Hotel Almyra, book online or view our special offers.